Being from Florida and not moving up north until I was in my 20's, I feel as though I have an extra appreciation for the season. And the transition from summer to fall is my favorite. Just chilly enough for a sweater and scarf, the scent of apple cider fills the air, leaves are changing to a variety of different colors, and you can't help but be happy in fall. And if you aren't happy in fall, you're related to the Grinch! Ha ha. Our early fall tradition has always been to take a weekend and spend the day pumpkin picking, having cider donuts, and enjoying the crisp fall air. 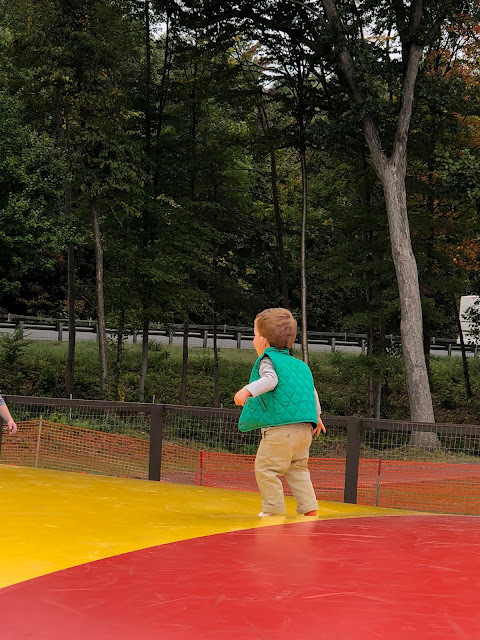 We have always gone to Jones Farm in years past, but this year, with a rambunctious toddler, we decided to try somewhere new and somewhere we've always wanted to visit. Fair Weather Acres. People. You know where this is. Every fall when you drive down I-91 you see it. It takes up ACRES on the side of the highway. My husband and I are always wondering what it is yet never take the time to venture there. Until this weekend. Holy wonderfulness. I cannot believe we've been missing out this entire time we've lived here! I hope the little snippits into our day give you an idea of how incredible this place it! There's SO much to do here! You take a hay ride to get from the parking lot and entrance to the back side of the entire 'fall festival'. It's $19 per adult to get in (apparently it's half price on Fridays after 2:00 so we're going back then!) and kids 2 and under are free. You get a hand stamp, can stay as long as you want, and it includes any pumpkin of your choosing. Yep, even giant ones! Everything is in a relatively open field and areas are clearly marked. The staff is very friendly and incredibly helpful, especially for us first-timers who probably looked a bit overwhelmed! The reason we went. For this little one to get to do THIS. Have you ever seen such an incredible sight?! 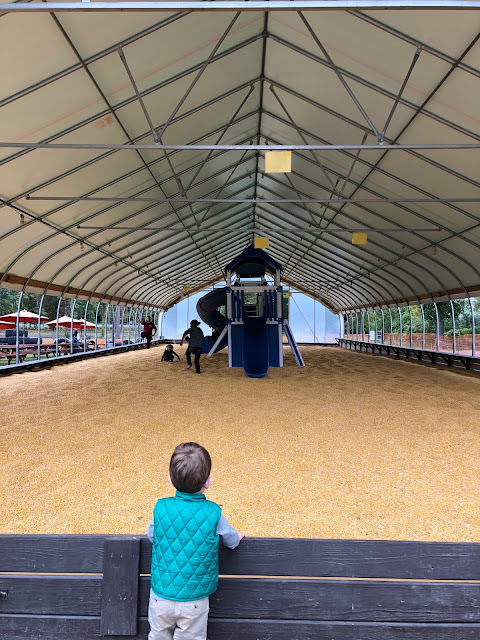 Not just the fact it was empty (this was 2 minutes after they opened, within 10 minutes there were a good 50 kids in it!) 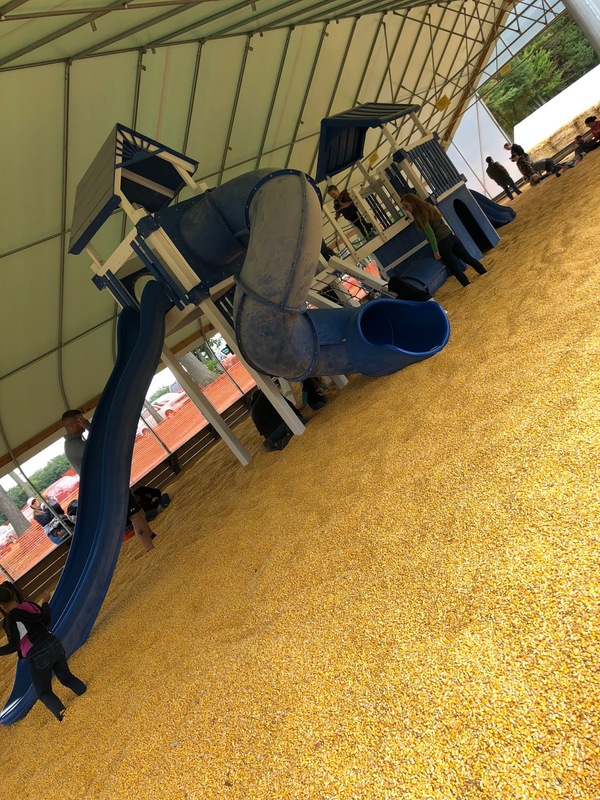 but a giant corn pit with a massive playscape inside of it?! If you didn't think it was fun, here's proof. Both for the actual young and young at heart. 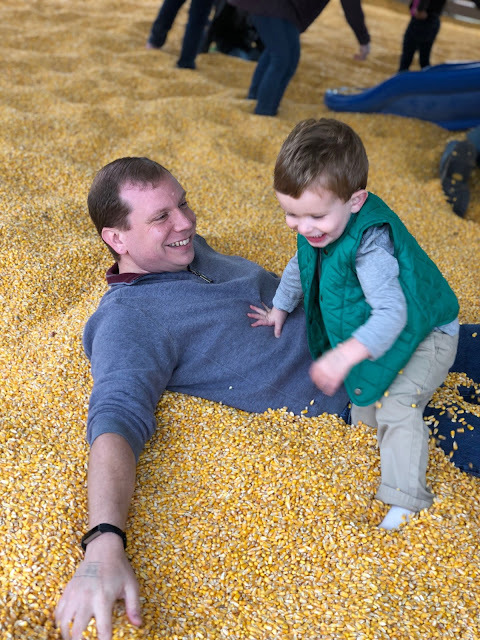 With tons of activities and games and things to do, it's a great place to go for a family day. 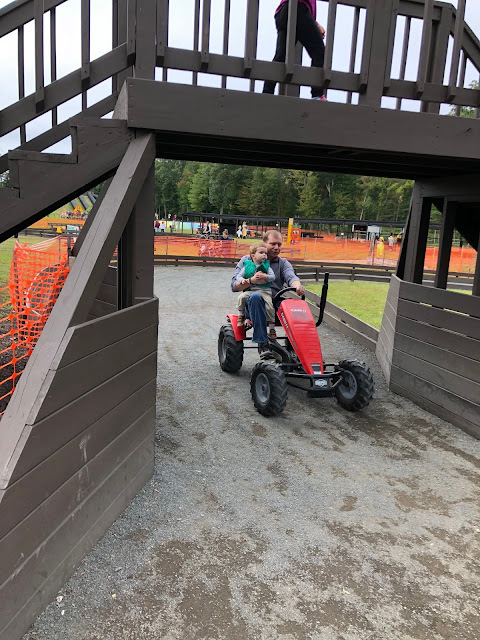 With big kids or young, it's a great time to had by all! I mean is this not the cutest little train you've ever seen?! OK. 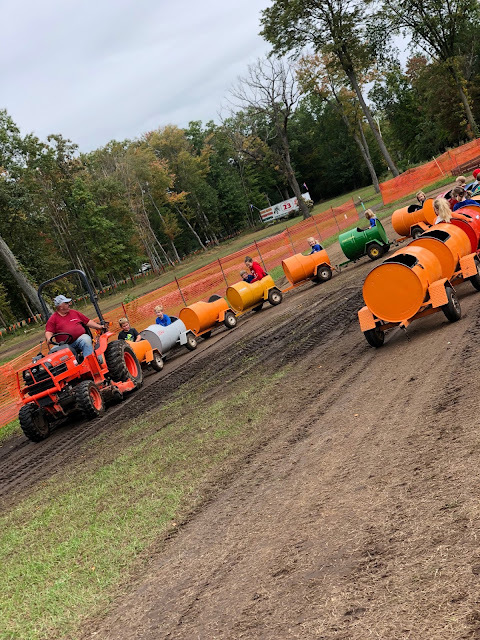 This made me a little nervous but the kids had a BLAST on it. It's a massive bounce pad, built into the ground, surrounded so they can roll off if need be. Which, for our little guy, was needed. They are VERY smart and have a height limit (I believe its 52") and they spilt the kids into two size groups. Then, they do waves and have the kids take turns. It's about a 3-5 minute period of jumping, which i sample time, and then they swap out for the other size group. I wish you could be bigger and adults could jump! 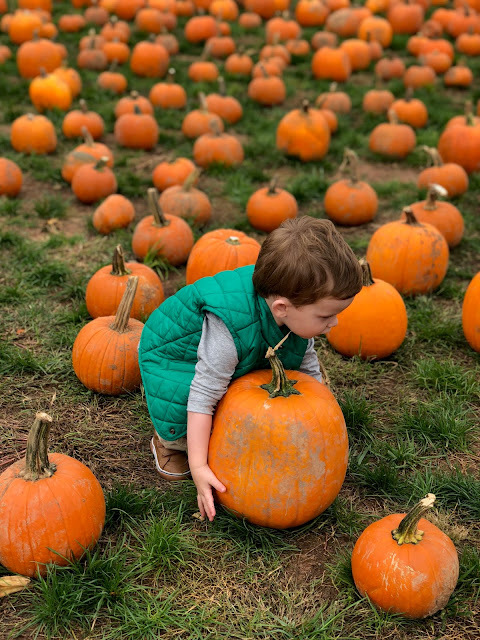 Why is it in a giant pumpkin patch filled with ALL sizes of pumpkins he decides that the BIG one is the one he wants?! The corn maze. There's clues scattered around for older kids and even a map for those worried about getting lost. But for a toddler, it's ample room to run! I am SO glad we finally decided to try this place out and I can't imagine not having this be a yearly tradition for us. Fair Weather Acres did NOT disappoint. We spent two hours there and could've easily spent another two hours there too. Have you ever been?! That place sounds fantastic! 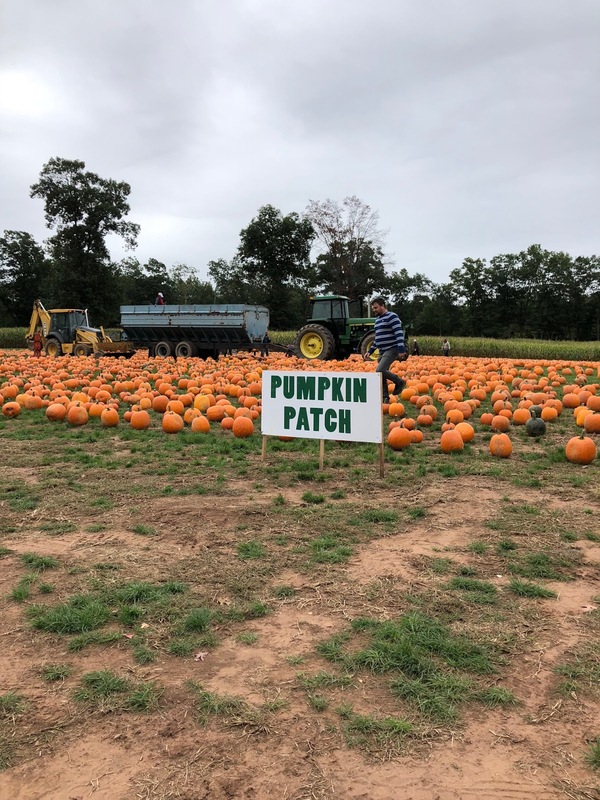 What a wonderful fall tradition.